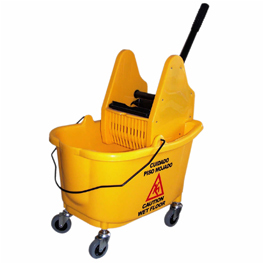 35 qt Bucket w/ Downpress Wringer Mopping Combo. Sides have Bold English/Spanish CAUTION message. Elevated bucket ledge for wringer leverage. Features Molded-in graduations make it easy to fill and mix accurately. Includes Full Size Downpress Wringer (wringer also available separately on this website). Chrome Handle and 3" non-marking, ball bearing bearing casters. Constructed of tubular steel and structural web molded plastic with nylon reinforced gears. Bucket Wringer are interchangeable with most manufacturer's equipment.